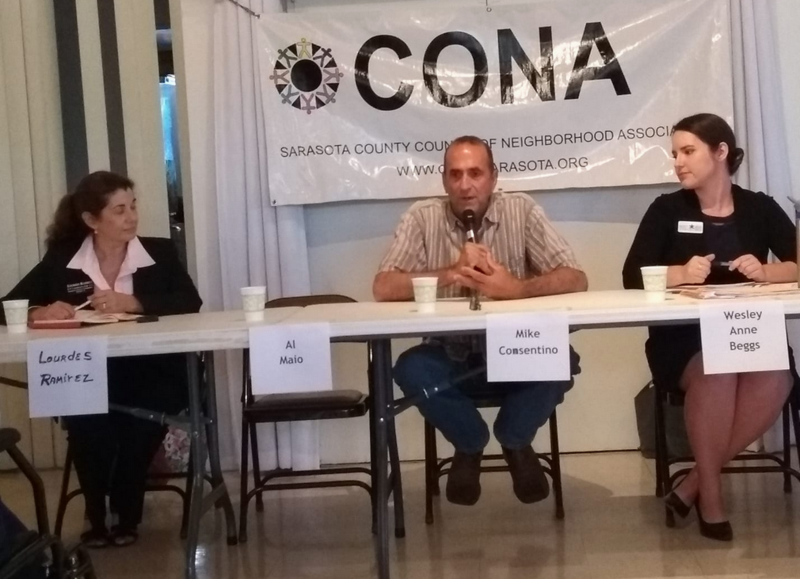 On Monday, May 13, CONA will host Charles Hines, who will discuss the priorities he has set for his term as the chair of the county commission. A native of the county, whose family has resided here for several generations, he has shown sensitivity to native habitats and environmental issues and has invited dialogue with the municipalities. Significant oversight and services are provided to neighborhoods by the county. Whether in a municipality or unincorporated area, the majority of taxes on properties are levied by the county government. Bring questions to submit for discussion. Following a half-hour networking opportunity at 6:30, the CONA meeting will open with traditional neighborhood updates about their current issues, to include Chris Bales on Arbor Lake Preserve, Bob Bernstein on Selby Gardens Master Plan, Ben Cannon on Bath and Racquet Club, Sura Kochman on Siesta Promenade, and Tom Matrullo on Celery Fields and Fresh Start. 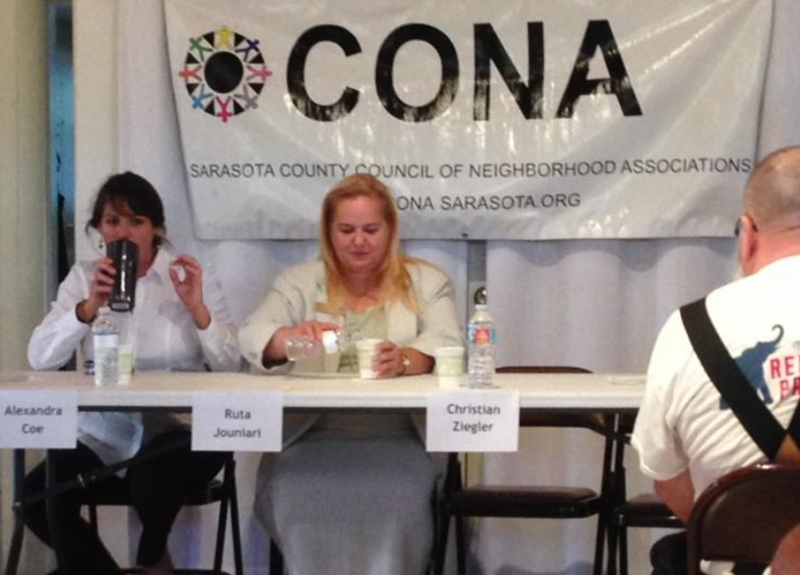 networking 6:30 p.m. - meeting 7:00 p.m.
CONA monthly meetings are free and open to the public as well as the members of the more than seventy associations the organization represents and our individual members. 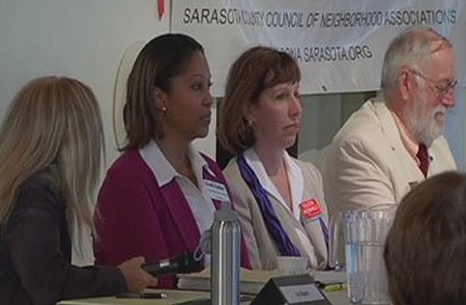 Regular monthly meetings are on second Mondays of the month at the Sarasota Garden Club, 1131 Boulevard of the Arts in Sarasota, at the intersection of Tamiami Trail, south of the Municipal Auditorium. Parking and the entrance are reached from Van Wezel Way. A networking opportunity at 6:30 precedes these regular monthly meetings that begin at 7:00 with neighborhood issue updates. We do not schedule regular monthly meetings in July or August unless there are pressing issues of immediate concern. Special meetings may be held on different dates, at other times, or at other locations, please check announcements and notices carefully. Special fund-raising events may be reserved to contributors who respond to advertisements of the event to members and the public. "I was extremely impressed with the probing questions—fine job." 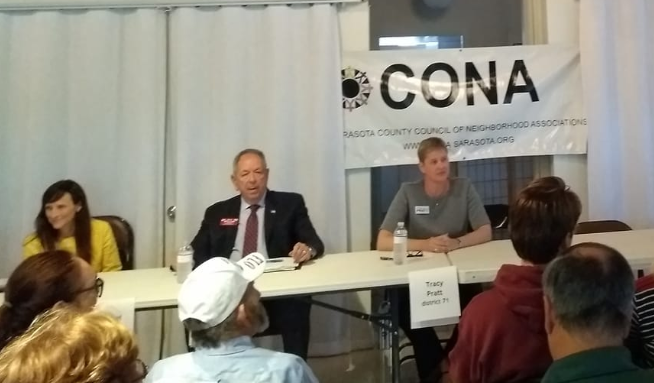 Although we had prepared for more guests for the following, general election forum, the meeting hall still was filled with a more than capacity crowd. Again, we had to bring out more chairs for those standing. Immediate feedback was equally as rewarding as that following the primary forum. February 2015 through 2016, Pete Theisen was the official CONA videographer, we are grateful for his contributions to keeping our members and the public informed. In 2017, some video was created by others, posting became delayed and follows as possible - on an individual basis - we hope to resume posting our meetings monthly, until then, links to videos made available to us graciously by others will be posted to the calendar listing and into the calendar archive for each year.